German technology is powering the High Care Wellness & Beauty Center at the Sunbeam Hotel on Soi 8, helping the clinic offer a broad range of health and rejuvenation treatments. High Care is staffed by a team of professionals who analyze blood for toxic substances and advise how to restore the body to a more-natural balance. The treatments below all fight disease, preserve youthful looks and foster a healthy quality of life. A high-end instrument from Germany makes it possible to see only in one blood drop a complete picture of the cells and the blood itself, generating a “bio-energy equilibrium” graph. The test helps detect latent diseases early. The chart also shows whether the blood contains toxins or excess heavy metals. The blood check luckily shows only light adipose and little heavy metal legacies in my cells. Colon hydrotherapy helps to clean the colon and can help reduce the chances of colon cancer. The process removes hardened excrement, lightening body weight and lowering toxin levels in the blood. The process is painless and easy and provides immediate relief. A patient lies on a toilet-like table as a therapist pumps liquid into the bowel. Patients can determine how far and how long the tube goes as the therapist gently massages the mid-section. At the end of the 45-minute treatment the patient gets either rectal or oral Bifidus or Acidophilus (friendly bacteria) to ensure a healthy balance for the body. 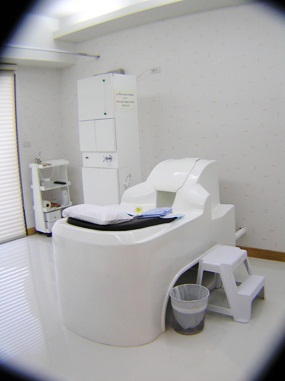 Right now until Dec. 21 the price for colonic hydrotherapy is almost half price at 1,750 baht. Germany is the home of the high-tech Vacumed device. It’s not unlike the Vacu-Styler used by astronauts in space to bring enough oxygen to the legs. Nothing is injected but the instrument works with negative pressure, meaning that the body is alternately treated with negative and positive pressure. This affects the veins and blood vessels and as well the lymphatic system. Blood is even conducted to the smallest capillaries during negative pressure treatment, while positive pressure helps to release egesta and carbon dioxide from the cells and skin particles. This helps especially against cellulite and dissolves fat. For this treatment one doesn’t has to disrobe. The treatment itself is gentle and comfortable. It helps also especially with edema, varicosis, circulatory disturbance, diabetic legs and artery problems. 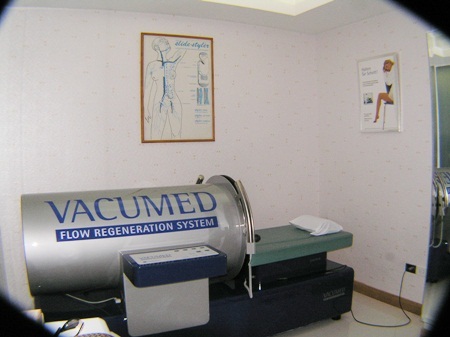 Oxygen therapy helps the body detox with negatively charged ions. The negative ions help re-supply necessary oxygen to the cells and destroy pathogenic bacteria, boosting the immune system. While being treated one lies comfortably on a bed and breaths oxygen through a mask while the muscles “exercise” with another machine. This treatment can be combined with the Chelatoion therapy for weight loss. Most women – and even some men – enjoy facial treatments and of course they are offered at High Care. The therapists give you all the information you would need. Just find the way to the center. The High Care Wellness & Beauty Center is at the Sunbeam Hotel in Soi 8. Call 038-427 120-9 or 083-073-7144.